I It’s been a few days since game six ended. I thought it best to let the dust settle and extract the essence from this upset. The Mavericks proved victorious over the Heat and won the series in six games. The "Big Three" made it to the finals in their first season together. They didn’t capture a championship but they did illustrate what playing the game is all about. You know the old saying, “It’s not about winning or losing, it’s how you play the game.” The trio that took the world by storm, LeBron James, Dwyane Wade and Chris Bosh, are considered the superfriends squad. They are likely the most athletic trio to come along, play on the court and be supported by willing and capable teammates who are ready to sacrifice personal achievements for the good of the team. It has been a long ride for LeBron James. He spent seven seasons as the Cleveland Cavaliers´ franchise player but could never get over the hump and win a title. LeBron entered the free agency market after the 2009-2010 season and was aggressively courted by multiple teams. The stage was set with "The Decision." Millions of people watched breathlessly and waited to find out if James was going to stay in Cleveland or move on to New York, Chicago or Miami. James, a two-time MVP, famously announced he was taking his talent to South Beach to join the Miami Heat along with fellow members of the 2003 Draft Class-Dwyane Wade and Chris Bosh who also joined in 2010. In 2011, LeBron James became the first Heat player in history to have a triple-double in the NBA All- Star Game and second player all time after Michael Jordan. 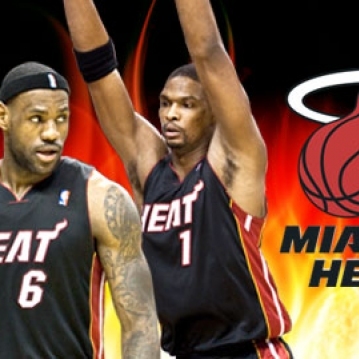 The Heat pride themselves on having a great team, who achieved something never done before. They signed three max-level contract players at once, completely revamping themselves. Never before has this happened. Not in the NBA, not in any other sport. To get 3 of the top 10 players in the league in one summer…was nothing less than monumental. The Heat´s season started rocky but ended stronger. It was another over the top showing by the "Big Three". Then Miami beat Chicago in five games and they were off to the finals. The Heat formed in 1988 as an expansion franchise. Since then, Miami squads have made the playoffs 15 out of 23 seasons. Captured eight division titles and won the 2006 NBA Finals against the Dallas Mavericks 4–2. According to Forbes Magazine, in 2010 the value of the franchise was $425 million. 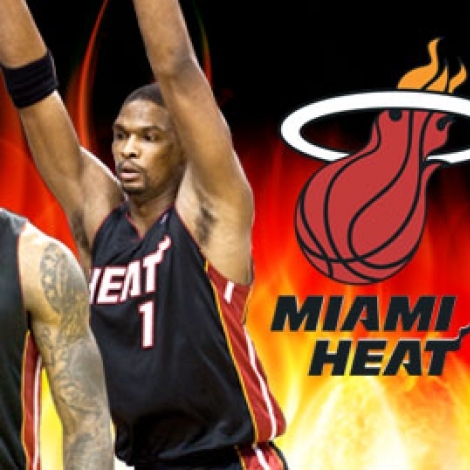 Chris Bosh joined the Miami Heat along with fellow "Redeem Team" teammates Dwyane Wade and LeBron James. Dwyane Wade (2003– present) who was picked fifth overall in the 2003 NBA Draft has been an All-Star since 2004. The Heat won their first NBA Championship in his third pro campaign and Wade was named the 2006 NBA Finals MVP as he led the Heat to a 4–2 series win over the Dallas Mavericks. At the 2008 Summer Olympics, Wade led the United States Men´s Basketball team in scoring as they captured gold medal honors in Beijing, China. "Each Warrior wants to leave the mark of his will,” Coach Riley reminds us, “and to leave his signature on important acts he touches. This is not the voice of ego but of the human spirit, rising up and declaring it has something to contribute to the solution of the hardest problems, no matter how vexing!" No matter how vexing, the scuttlebutt is about the Heat, the trio, the loss, the decision, the contracts, the tweets, the ego, the Karma, it is more than I am willing to negotiate for this article. Suffice to say, it takes guts and glory to play, to lose and to win. It’s all a matter of perspective. You get to choose what you want to see and believe. This is July, the month of our Independence. May you be independent from other people’s opinions and focus on extracting the essence from the game of life!